Choosing an engagement ring and a wedding ring in the 21st century can be a tough job, because there are many different options to chose from and finding a perfect match for you might seem impossible. Of course, a lot depends on where you are from and what are the traditions in your country. So some us may think for a minute about how wedding rings looked like back then, what the trends and the traditions were during old times. Well, we were interested as well, so we tried to collect all of the most interesting engagement and wedding ring ancient trends and present them to your attention. Who knows may be you will find the perfect idea of a ring down here. Many historians believe that around 3000 years ago, in Ancient Egyptians utilized braided hemp or reed rings and the circle of the rings symbolized love between man and a woman. Ancient Romans had many forms of marriages but the closest one to modern weddings was Calvary acteal. Only people of higher class were allowed to arrange such kind of marriages and the interesting part is that it was the only legal form of a marriage. During the wedding ceremony, the groom gifted the bride with a ring made of iron, which was a very valuable metal at that times. 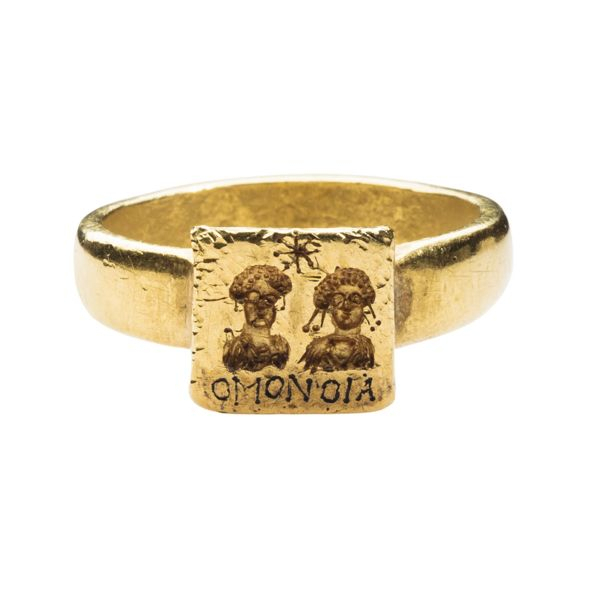 During the time, more personalized rings became popular, on which Romans would carve the faces or full figures of the couples. The same practice was carried over to the Byzantine Empire, but after adopting Christianity, Jesus and/or a cross were also carved next to the couple. In Middle East, puzzle rings were popular as a token of love. 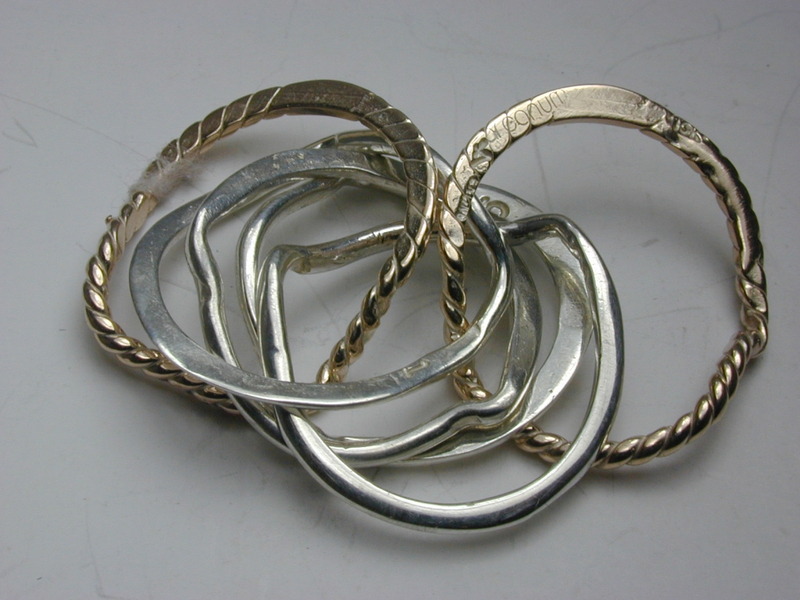 Puzzle rings were made of several different bands and could be combined together to form one piece. During 1500-1600, Europeans also had similar type of wedding rings, which were called gimel. During the engagement, the bride and the groom exchanged the 2-piece ring and during the wedding combined those together and wore it as a whole ring. Many gimmel rings featured forget-me-not flowers, red hearts, a skeleton and a baby, symbolizing life, death and eternal love after the life on earth. Another interesting design of rings was introduced in Ireland in the 16th century with a Claddagh ring, which was a ring with interlocking two hands holding a heart with a crown. Not surprisingly, during the Renaissance era, the couples exchanged Posy rings. Posy stands for the word poem, thus meaning that the inner or the outer parts of the rings were engraved with love poems. During the 15th century, when they were first introduced, only the outer part of the rings was engraved, but later, messages engraved became more personalized, forcing the jewelry makers to learn how to engrave on inner part, to keep the message more private. This style emerged from 1714 to around 1830. As Greek design and art were in the trend during this period, these rings featured vines, flowers or wheat stalks. They also were set with different types of gemstones such as emeralds, pearls, sapphires. Victorian style of engagement rings was popular during 1835 and 1900. Rings from this era were made with bride's birthstone, that was very big and bright. These rings were made with gold or rose gold and featured hearts, flowers or birds. 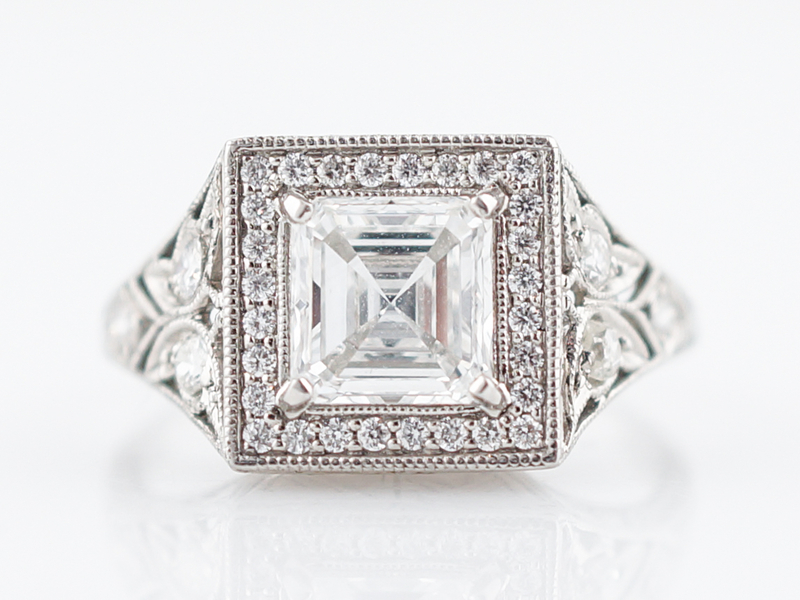 Art Deco is an engagement ring style that was popular between 1915 and 1935. These type of rings featured geometric elements, linear designs and sharp edges. Art Deco rings featured elements from Asian, Egyptian or African cultures. Most of these rings were made of platinum and had diamond stones on them. Later this rings were also made with gold and silver and had other gemstones of different colors. During the 18th century, while posy rings were still a thing, 'keeper' rings became popular. These rings were worn together with the wedding band from either of sides to protect it. The rings were made of rose cut diamonds set in silver and gold. The first attempt of gifting a diamond ring during an engagement dates back to 1477 when the Archduke Maximilian of Austria presented one to his loved one. Modern diamond engagement rings feature a diamond which is usually 1 carat or larger and can feature smaller diamonds as well. Moreover, the emerging trend today are 3-stone diamonds, which are one large diamond at the center and 2 smaller ones from the both sides. Nowadays, no certain engagement ring or wedding ring trend exists. Many people, especially in European countries like France or UK, prefer gemstone engagement rings, especially after Prince Williams proposed to Kate Middleton with his mother Princess Diana's ring with a purple gemstone. People tend to not follow the trends anymore, but rather have something created especially for them, something to mark their personality, their values and beliefs. So you can be free in choosing the perfect engagement ring for your loved one. You can either chose to follow the specific traditions of your country and culture, you can chose a vintage ring that has an ancient ring design or you can order a customized ring specifically made to match your beloved's wants and needs.